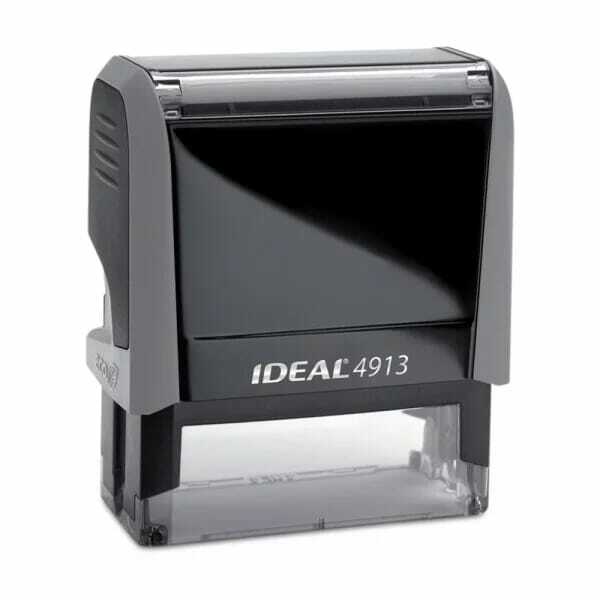 The Ideal 4913 self-inking stamp has a maximum text plate size of 7/8" x 2-3/4" - (22 x 58 mm) allowing you to create up to 5 lines of customized text. This versatile stamp is perfect for multiple applications including address stamp with email, business address with logo, notary stamp, and signature stamp. You can upload your own logo or artwork in our stamp wizard! The Ideal 4913 contains post-consumer plastic and is a climate neutral product, so you can feel good about helping the environment. The replacement ink cartridge 6/4913 is available in black, blue, red, green or violet. Replacement pads are supplied in packs of three. Customer evaluation "Ideal 4913 7/8" x 2-3/4" - up to 5 lines"
Was exactly what I ordered,. Good value. Fast delivery. Will order from them again.